Lightspeed Restaurant is a cloud-based Point-of-Sale (POS) system designed specifically for restaurants, bars, cafes, and other similar establishments that simplifies staff management, inventory management, guest reservations, and more. With aspects of restaurant management covered, Lightspeed Restaurant POS makes it easy for you to build your menu, create and implement schedules for employees, take and manage orders, facilitate payment, and monitor performance among others. And because Lightspeed Restaurant POS is based in the cloud, you can easily access the system from anywhere at any given time from your smartphone or tablet. Whether you are away from your restaurant or on the road off to somewhere, you can log in to your system and manage your entire operations from the palm of your hands. Lightspeed Restaurant POS is more than just a Point of Sale system designed for restaurants, bars, coffee shops, cafes, and more. It is a robust business management platform that makes restaurant management a breeze for you and your staff. The software comes with an array of floor management capabilities to help you stay on top of your menu and your floor plan. With a user-friendly drag-and-drop interface, you can make changes to the table arrangements as well as create and edit your menu in a few moments. When you’re working on your menu, you can easily add photos to go along your items as well as the price and description. Tableside ordering functionality allows you to take orders from your guests faster than ever. Customers’ orders are sent directly to the kitchen or bar, eliminating the need for the staff to wait for an open terminal to input their order. This feature greatly accelerates the process, resulting in your guests getting their orders faster than ever. The Tableside feature also makes it easy for guests to choose how to settle their bill. Lightspeed Restaurant POS automatically splits or combines bills and provide other flexible payment options to ensure that guests have a great dining and wining experience in your establishment. Each enterprise has its own characteristics, and may call for a special POS Software solution that will be designed for their business size, type of clients and employees and even particular niche they deal with. It's not wise to count on getting an ideal services that is going to work for each company regardless of their background is. It may be a good idea to read a few Lightspeed Restaurant reviews first and even then you should keep in mind what the software is supposed to do for your company and your workers. Do you need an easy and straightforward solution with just elementary functions? Will you actually make use of the complex functionalities required by experts and big enterprises? Are there any specific tools that are especially practical for the industry you operate in? If you ask yourself these questions it will be much easier to get a reliable service that will fit your budget. How Much Does Lightspeed Restaurant Cost? We realize that when you make a decision to buy Restaurant Management Software it’s important not only to see how experts evaluate it in their reviews, but also to find out if the real people and companies that buy it are actually satisfied with the product. That’s why we’ve created our behavior-based Customer Satisfaction Algorithm™ that gathers customer reviews, comments and Lightspeed Restaurant reviews across a wide range of social media sites. The data is then presented in an easy to digest form showing how many people had positive and negative experience with Lightspeed Restaurant. With that information at hand you should be equipped to make an informed buying decision that you won’t regret. We have been using Lightspeed at our small cafe - LOVE IT! What are Lightspeed Restaurant pricing details? 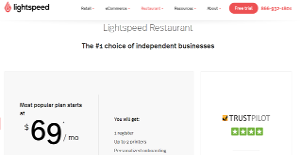 What integrations are available for Lightspeed Restaurant? Pros: Le support technique est vraiment super. Très efficace! Cons: Nous avons du faire des ajustements au tout début, puisqu’à la base le logiciel n’est pas adapté spécialement pour un Spa. Le support technique est vraiment super. Très efficace! The different interfaces your able to have on a restaurant platform. Regardless of what type of service you want to offer, they have all the solutions! Just installed Lightspeed at the Montreal Racket Club and can’t believe how simple to use and install it is. Would definitely recommend! Shockingly satisfied by this POS. Easy to use simple and intuitive interface. LightSpeed bringing the future of POS technology today. Ease and Use. It's simple yet has enough advanced settings to customize to your business model.